Who are the mystery buyers of Sparrows Point? 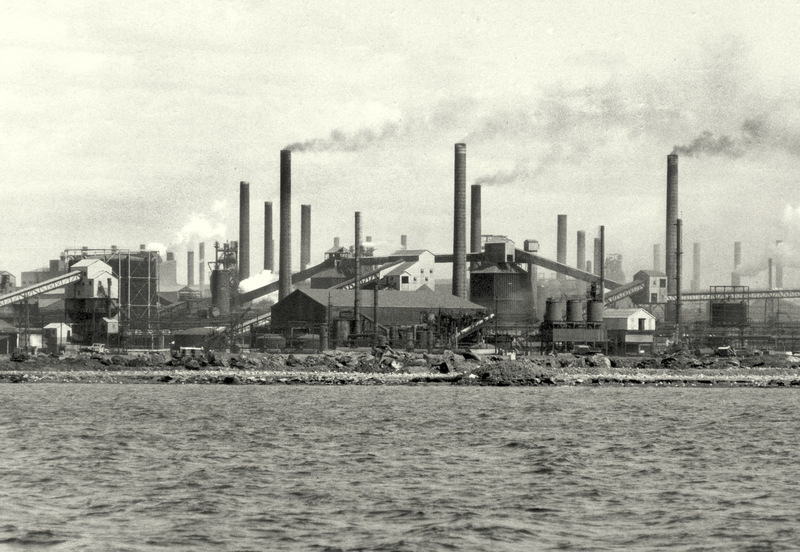 Above: Coke ovens and blast furnace stacks fill the sky with smoke in this 1976 photo of Sparrows Point. A “local investment group” has agreed to buy a large chunk of the 3,000-acre Sparrows Point peninsula that once held the world’s largest steel mill, according to court papers filed on Tuesday. The sale could breathe new life into plans for the redevelopment of the site. But the big question of the moment: who are the investors? Gerard P. Martin, a lawyer for the current owners, claims not to know their identity, according to The Daily Record. The information has also not been disclosed by Baltimore City or Baltimore County, which have stakes in the property through infrastructure investments. Baltimore City Solicitor George Nilson said today he “can’t provide” the name of the prospective purchaser or the identities of the investors. A spokesman for Baltimore County Executive Kevin Kamenetz said he “could not publicly disclose the prospective purchaser” and referred all questions to Hilco Global, the current owner, whose Chicago office would not reveal the identity of the possible purchasers. Another key stakeholder is the Maryland Port Administration, which has been seeking to buy Coke Point, a 300-acre section of Sparrows Point, to contain harbor dredge and eventually for docks to accommodate an auto terminal and Panamax super-cargo ships. Negotiations with the current owners to buy Coke Point have stalled. 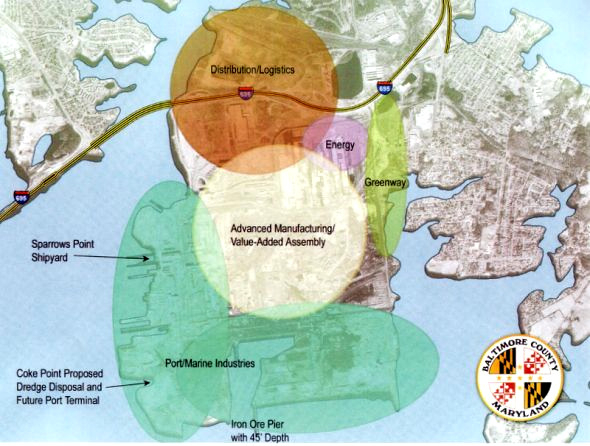 New ownership could also foster Kamenetz’s vision of retooling the peninsula for advanced manufacturing based on its proximity to a deep-water port and to highway and rail transportation. Nearly 3,000 employees and independent contractors were thrown out of work. Hilco Global, the liquidator, and Environmental Liability Transfer, the redeveloper, jointly formed Sparrows Point LLC and purchased the plant from RG Steel in September 2012. The group’s lawyer, Gerard Martin, disclosed to U.S. District Court Judge James K. Bredar on Tuesday that ELT had sold its share to Hilco, which in turn “has just agreed to sell a significant percentage” of the property to the local investment group. The disclosure came as a result of a dispute between Baltimore City and ELT over the disposal of treated sewage from the city’s Back River Wastewater Treatment Plant. Under an agreement dated back to the 1940s, a large amount of treated water was piped to the steel plant rather than dumped in Back River. Last year, ELT sought to terminate the agreement, which obligates them to take up to 40 million gallons a day of city wastewater from Back River. The city filed suit and the company agreed to let the city use the pipelines in return for a higher monthly fee. The agreement was set to expire next month, which led to the filing of documents by Sparrows Point LLC asking for an extension of the pact to give the parties time “to close on property transfers and reach agreement on the solution to the existing water problems,” according to Martin. Senior Brew reporter Mark Reutter is the author of “Making Steel: Sparrows Point and the Rise and Ruin of American Industrial Might” (University of Illinois Press, 2004).